Gina Haspel will become the first woman to lead the CIA after the Senate confirmed her on a 54-45 vote Thursday afternoon. Unlike the votes for many of President Trump’s Cabinet officers, the final tally on Thursday did not fall neatly along party lines. Six Democrats set aside concerns about Haspel’s involvement with the torture of a suspected terrorist after September 11, overcoming opposition from a trio of Republicans that could have sunk her nomination. GOP Senators Rand Paul of Kentucky and Jeff Flake of Arizona voted against Haspel. Senator John McCain, who’s undergoing treatment for brain cancer in Arizona, did not vote, but he urged the Senate to reject her as well. Given the GOP’s narrow, 51-49 seat majority, had all Democrats opposed Haspel, she would not have been confirmed. But she won support from Senator Mark Warner of Virginia, the top Democrat on the Intelligence Committee, along with several Democrats who are facing tough reelection campaigns in states that Trump won in 2016. Haspel has spent her career at the CIA and now serves as its deputy director. In 2002, she oversaw a CIA prison where a detainee was waterboarded, and she was involved in the agency’s decision to destroy tapes on interrogation sessions. She benefitted from the backing of several top intelligence officials under former President Barack Obama. They included John Brennan, the ex-CIA director who has been harshly critical of Trump. 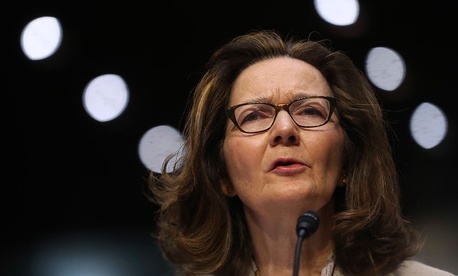 Haspel also won over some wavering senators after writing in a letter that “with the benefit of hindsight,” the enhanced interrogation program should not have been used. “I believe she is someone who can and will stand up to the president if ordered to do something illegal or immoral—like a return to torture,” Warner said in a statement announcing his support. Other Democrats assailed Haspel and the CIA for withholding information about her record under the guise of secrecy. “There is much more that the full Senate and the public should know about Haspel’s background, and I am convinced that, if they did, her nomination would be rejected,” Senator Ron Wyden of Oregon tweeted shortly before the vote. Haspel will replace Mike Pompeo, who the Senate confirmed last month as secretary of state. The second-year shuffle in Trump’s national-security team began when the president fired Rex Tillerson as secretary of state in March.